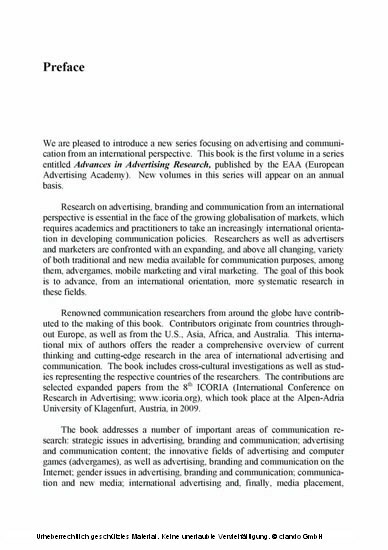 The goal of the book is to advance more systematic research in the fields of advertising and communication form an international perspective. 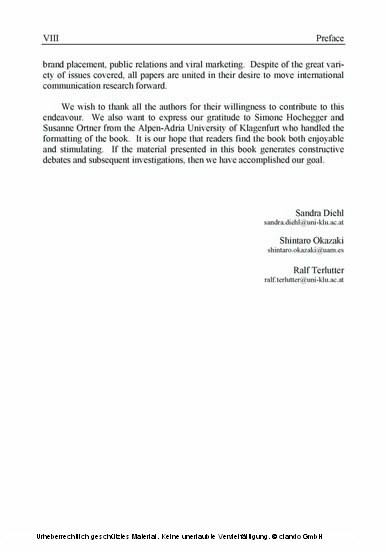 Renowned communication researchers from around the globe have contributed to the making of this book. Prof. Dr. Ralf Terlutter is Professor at the Department of Marketing and International Management at the University of Klagenfurt, Austria. Prof. Dr. Sandra Diehl is Professor at the Department of Media and Communication Sciences at the University of Klagenfurt, Austria. Prof. Dr. Shintaro Okazaki is Professor at the Department of Finance and Marketing Research at the Autonomous University of Madrid, Spain. 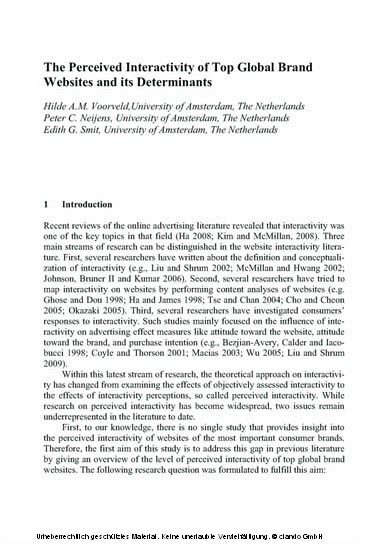 Recent reviews of the online advertising literature revealed that interactivity was one of the key topics in that field (Ha 2008; Kim and McMillan, 2008). Three main streams of research can be distinguished in the website interactivity literature. First, several researchers have written about the definition and conceptualization of interactivity (e.g., Liu and Shrum 2002; McMillan and Hwang 2002; Johnson, Bruner II and Kumar 2006). Second, several researchers have tried to map interactivity on websites by performing content analyses of websites (e.g. Ghose and Dou 1998; Ha and James 1998; Tse and Chan 2004; Cho and Cheon 2005; Okazaki 2005). Third, several researchers have investigated consumers’ responses to interactivity. 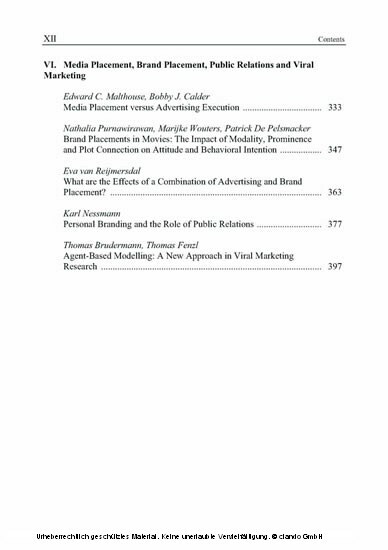 Such studies mainly focused on the influence of interactivity on advertising effect measures like attitude toward the website, attitude toward the brand, and purchase intention (e.g., Bezjian-Avery, Calder and Iacobucci 1998; Coyle and Thorson 2001; Macias 2003; Wu 2005; Liu and Shrum 2009). Within this latest stream of research, the theoretical approach on interactivity has changed from examining the effects of objectively assessed interactivity to the effects of interactivity perceptions, so called perceived interactivity. 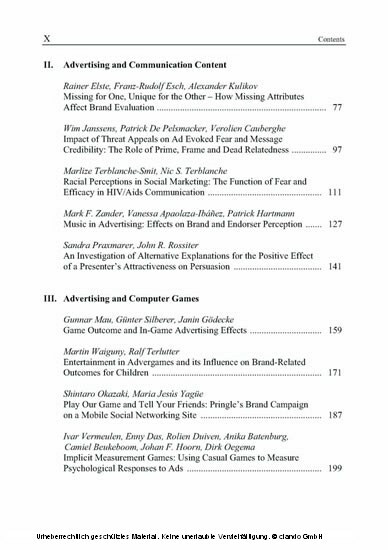 While research on perceived interactivity has become widespread, two issues remain underrepresented in the literature to date. First, to our knowledge, there is no single study that provides insight into the perceived interactivity of websites of the most important consumer brands. 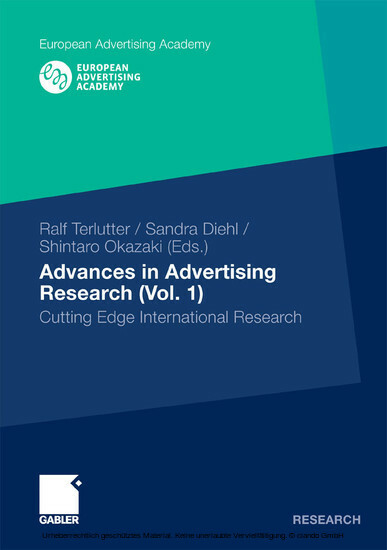 Therefore, the first aim of this study is to address this gap in previous literature by giving an overview of the level of perceived interactivity of top global brand websites. 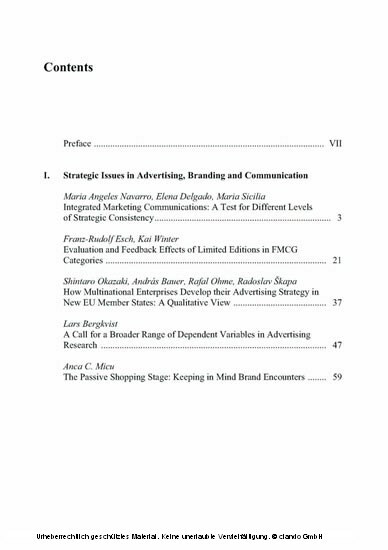 The following research question was formulated to fulfill this aim: RQ1: What is the level of perceived interactivity of top global brand websites? Second, whereas research on the consequences of perceived interactivity is abundant, research on its determinants is scarce. The research up to now has primarily investigated website characteristics that influence interactivity perceptions. 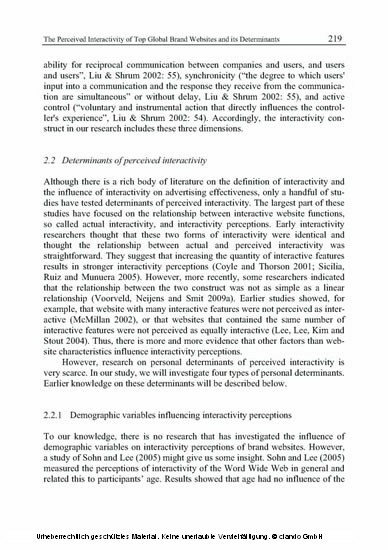 To our knowledge, research focusing on person characteristics, such as demographic variables or experience variables, influencing interactivity perceptions is almost non-existent (Jee and Lee 2002), but vital for the field of interactivity research (Tremayne 2005). Therefore, the second aim of this study is to give insight into the personal determinants of perceived interactivity. 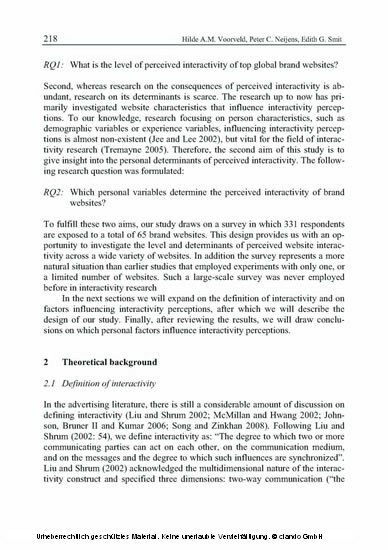 The following research question was formulated: RQ2: Which personal variables determine the perceived interactivity of brand websites? To fulfill these two aims, our study draws on a survey in which 331 respondents are exposed to a total of 65 brand websites. This design provides us with an opportunity to investigate the level and determinants of perceived website interactivity across a wide variety of websites. In addition the survey represents a more natural situation than earlier studies that employed experiments with only one, or a limited number of websites. Such a large-scale survey was never employed before in interactivity research In the next sections we will expand on the definition of interactivity and on factors influencing interactivity perceptions, after which we will describe the design of our study. Finally, after reviewing the results, we will draw conclusions on which personal factors influence interactivity perceptions. 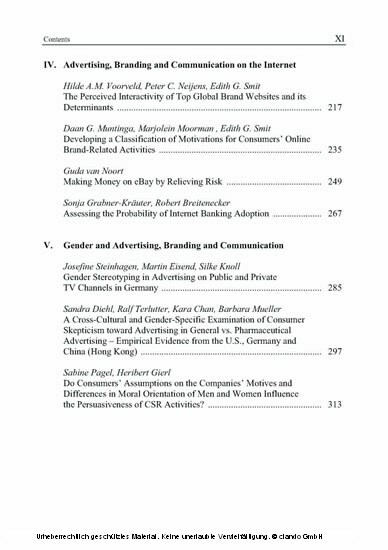 Do Consumers’ Assumptions on the Companies’ Motives and Differences in Moral Orientation of Men and Women Influence the Persuasiveness of CSR Activities? What are the Effects of a Combination of Advertising and Brand Placement?